Home » Viral Posts » Video: 17 Feet Long And Weighing Nearly A Tonne! Video: 17 Feet Long And Weighing Nearly A Tonne! 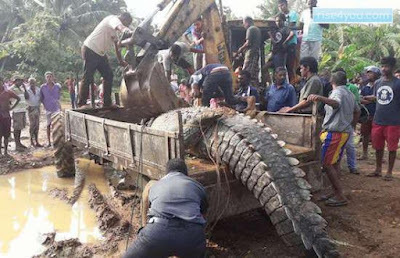 The crocodile had become stuck in a canal leading out of the Nilwala river, and was hoisted out and captured in Matura, Sri Lanka. Local media said the crocodile weighed about a tonne and had become stuck in the canal while searching for food when heavy rains caused the water to rise.